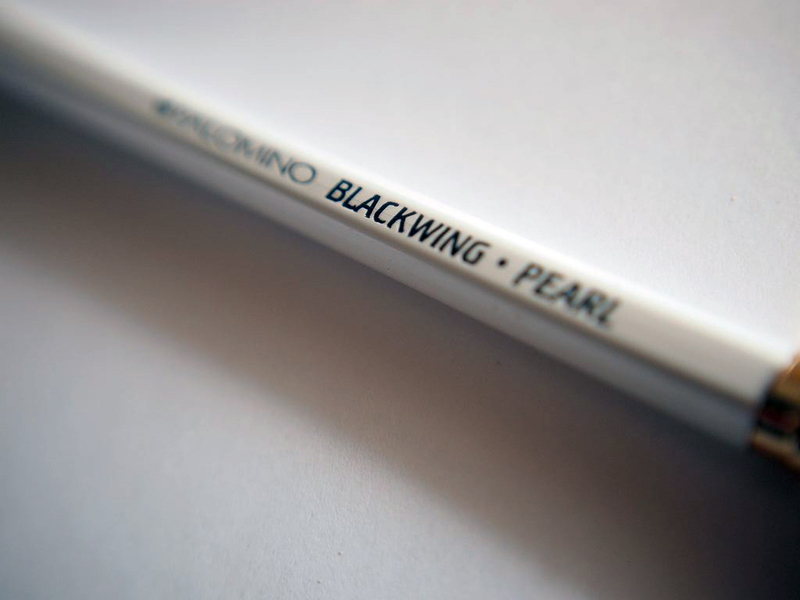 Palomino’s Blackwing line has made a name for itself as a worthy inheritor of the Blackwing name. With their gorgeous finishes, iconic ferrules and replaceable erasers, and ultra-smooth dark leads, the line has earned its reputation as a premium writing pencil. The Pearl is the third and latest entry in the line, with a lead midway in softness between the original Palomino Blackwing and the harder Blackwing 602. 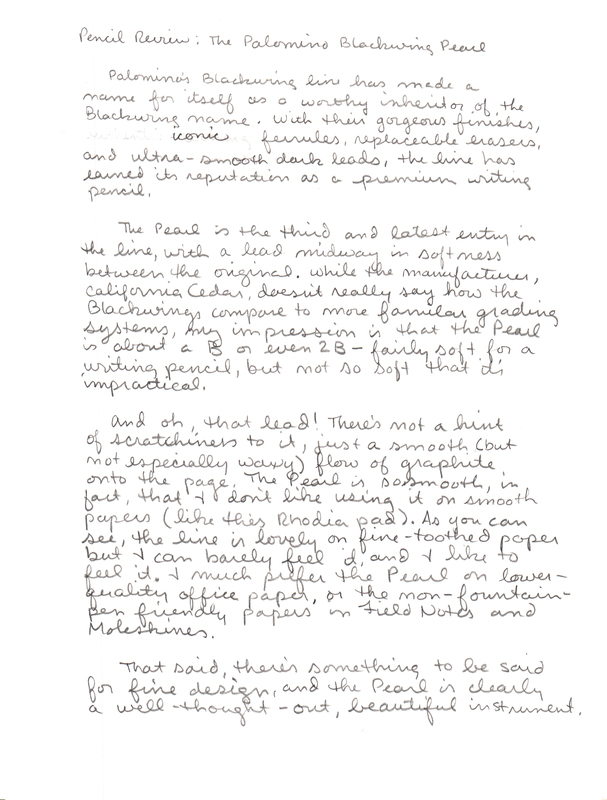 While the manufacturer, California Cedar, doesn’t really say how the Blackwings compare to more familiar grading systems, my impression is the the Pearl is about a B or even 2B — fairly soft for a writing pencil, but not so soft that it’s impractical. And oh, that lead! There’s not a hint of scratchiness to it, just a smooth (but not especially waxy) flow of graphite onto the page. 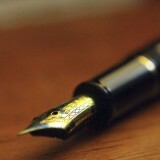 The Pearl is so smooth, in fact, that I don’t like using it on smooth papers (like the Rhodia pad I use for reviews here). 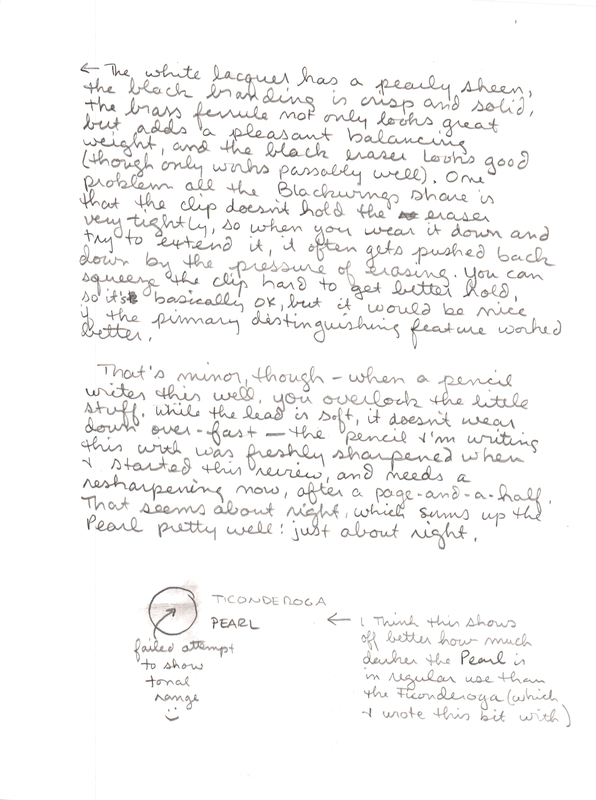 The line is lovely on fine-toothed paper, but I can barely feel it against the pad, and I like to feel a little something when I write. I much prefer the Pearl on lower-quality office paper, or the non-fountain-pen friendly papers in Field Notes and Moleskine notebooks. That said, there’s something to be said for fine design, and the Pearl is clearly a well-thought-out, beautiful instrument. 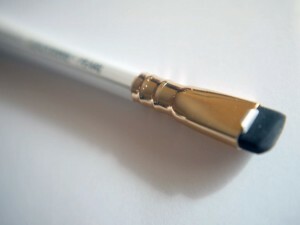 The white lacquer has a pearly, almost iridescent, sheen, the black branding is crisp and solid, the brass ferrule not only looks great but adds a pleasant balancing weight, and the black eraser looks good (though works only passably well). 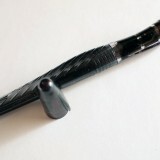 One problem all the Blackwings share is that the clip doesn’t hold the eraser very tightly, so that when you wear it down and try to extend it, it often gets pushed back into the ferrule by the pressure of erasing. 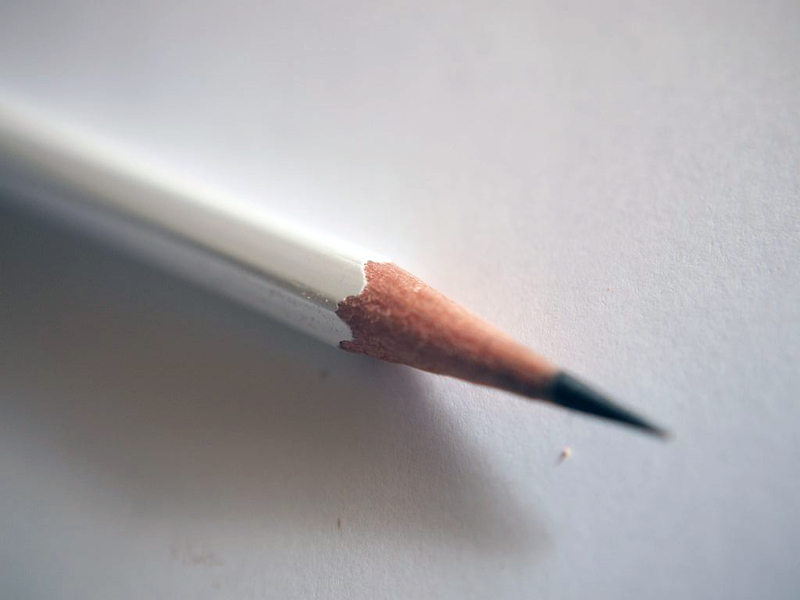 You can squeeze the clip hard to get better hold, so it’s basically ok, but it would be nice if the primary distinguishing feature of this pencil worked a little better. 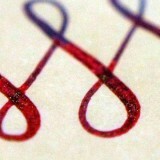 That’s a minor complaint, though — when a pencil writes this well, you overlook the little stuff. 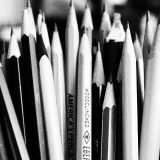 While the lead is soft, it doesn’t wear down over-fast — the pencil I wrote the review with was freshly sharpened when I started, and needed a sharpening by the end, after a page-and-a-half. That seems about right, which sums up the Pearl pretty well: just about right.